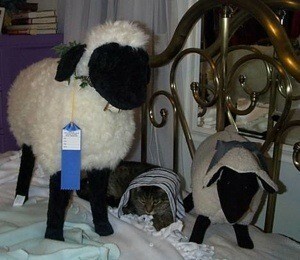 Here is a picture of our cat (his name is Desmond Morton) in the middle, dressed like a shepherd with my sheep. How cute. Looks like you won a ribbon. Did you make the sheep? What a darling little sweet joy under the shepherd's head dress! Darling! Give it a hug for me! Absolutely adorable and what a cute idea! I love your sense of humor! Great pic! Too cute for words! He looks so docile, like ho hum, what will these "people" do next?